Yesterday’s iOS 5.0.1 update was the first iOS firmware update to be made available as an OTA (over the air) update. And it appears to have gone very well – at least from what I can gauge from my own results on three iOS devices, good results for all my colleagues at iSource.com, and reactions I’ve seen round the web so far. I did the OTA update yesterday on the original iPad my wife and daughter share, my iPad 2, and my iPhone 4S. Each of them downloaded the update in 3-5 minutes and ran the install in 5-8 minutes. OTA updates were seen to be working nicely in the later rounds of the iOS 5 betas, but it’s good to see the first one available to the general public go smoothly. How was your iOS 5.0.1 update experience? Did you do the OTA update? If so, how did it go for you? 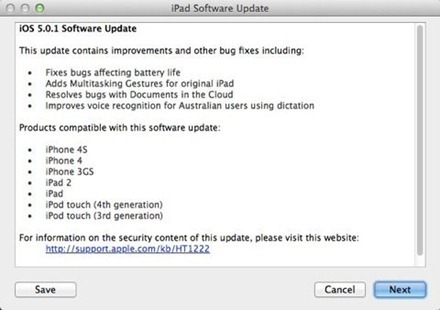 As expected, the iOS 5.0.1 firmware update released today for iPad (and iOS devices) has fixed the recently exposed iPad 2 security issue, the one that allowed anyone with a smart cover to bypass the iPad 2’s passcode lock. Hold the power button until the “Swipe to turn off” button appears. This would leave you wherever the iPad 2 was prior to being locked. 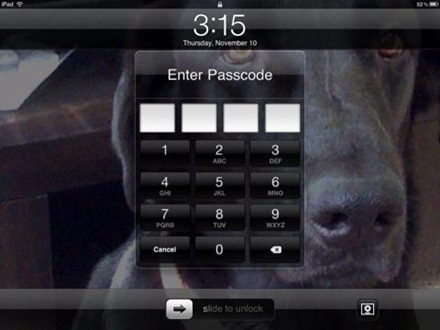 Now this leaves you where you still need to enter your passcode. Good to see that vulnerability eliminated fairly quickly. 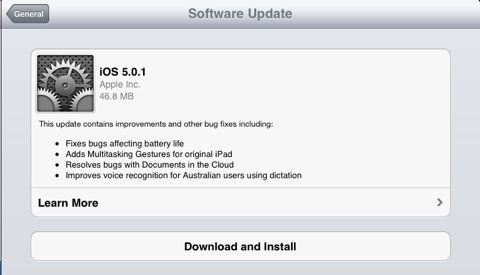 The iOS 5.0.1 update is out now. It’s available to download and install via iTunes, though not yet out as an OTA update. It may also fix the security issue with the iPad 2 and passcode lock. Here’s some very good news for owners of an original iPad. 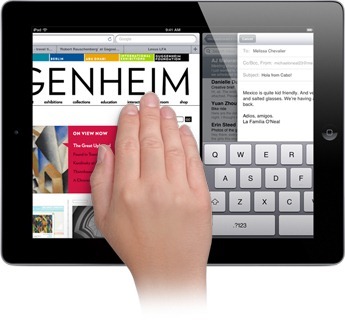 The first update for iOS 5 – iOS 5.0.1 – will ad multitasking gestures for the original iPad. These slick new gestures – which were added to the iPad 2 with the release of iOS 5 – allow you to use four or five fingers to: pinch inwards to return to the home screen from any app, swipe up to launch the multitasking bar, and swipe left or right between apps. They’re one of my favorite things about iOS 5 and they make it much easier and faster to do things on the iPad – especially in terms of rapid app switching. There was never any good reason that I’m aware of to not have these gestures available on the original iPad – so it is very good to see that they’ll be added in the first iOS 5 update. Hopefully this update will be released quite soon, as it also address some battery life issues and a security and the iPad 2 passcode bypass security vulnerability. Would You Like An Option To Turn Off Tabbed Browsing on the iPad? 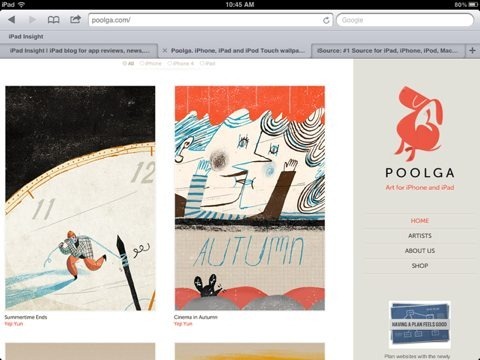 In iOS 5 the iPad’s Safari browser no longer shows a separate view with thumbnails for each page currently open, as it did in previous iOS versions. Instead Safari now uses tabbed browsing, which has been popular for some time on desktop browsers and even several alternative browsers for the iPad. Judging by the comments on my first post about tabbed browsing in iOS 5, there are a number of you who hate this change in Safar, hate tabbed browsing. I like tabbed browsing a lot. I‘m always running a crazy number of open tabs in Chrome on my MacBook Pro, and I generally have quite a few open on the iPad 2 as well. What’s the Point of Newsstand Automatic Background Downloads? So far Newsstand’s touted ability to automatically download updates is not living up to its billing for me. In fact, so far I don’t see what advantage there is in its background downloads – as it does not seem to have improved the initial load time for the titles that are using it. Admittedly I’ve only got seven apps at the moment which have been updated for Newsstand, and several of them are monthly titles which have not had a content refresh since being added to Newsstand. 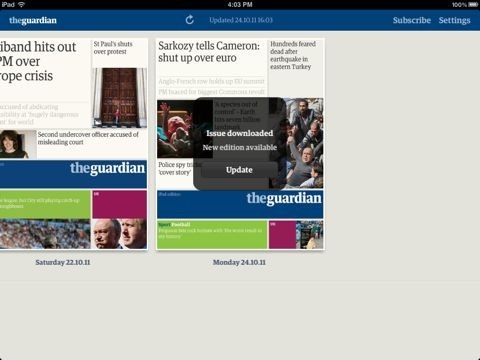 But I do have two titles that are updated 6 and 7 days a week – The Guardian iPad Edition and The Daily. Both are set to automatically download new content in Settings > Store, yet so far just about every time I open either one of them – even when they have the blue ‘New’ banner on them in Newsstand – they seem to require a fair while to locate a new issue and load up the front page. 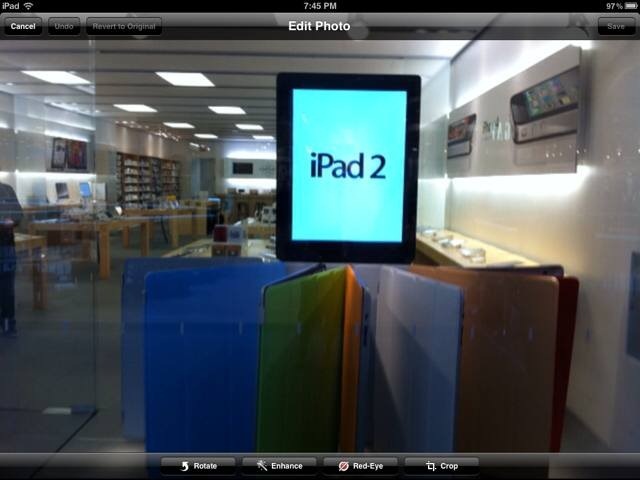 Why Can’t the Original iPad Have the iOS 5 Photo Editing Feature? As several of you have mentioned in comments on some recent iOS 5 related posts here, the new basic photo editing features added to the Photos app in iOS 5 are not available on the original iPad. My understanding is that the reason for this is said to be because the original iPad doesn’t have a camera. If that is the reason, it seems a very weak one to me. The original iPad does not have a camera, no argument – but Apple is happy enough to sell a $30 accessory (the Camera Connection Kit) that serves to bring photos to the iPad. So Apple knows that users want to get photos onto the iPad, and they’ve got an accessory that helps them do it – why not enable the basic photo editing features? This doesn’t strike me as an issue where there’s any hardware spec deficit on the original iPad. Perhaps I’m missing an obvious and more valid reason for the lack of the photo editing features. If so, I hope one of you will point it out in the comments, because the ‘no camera’ reason doesn’t feel like it cuts it. Hopefully if that;s the only reason, then we might see the feature added in an iOS 5 update. 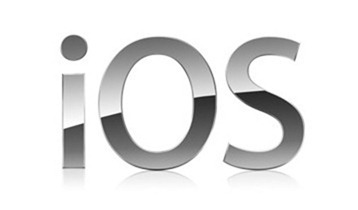 iOS 5 – the much-anticipated latest major update to the iPad and iPhone operating system – has been released by Apple today. — Make sure you have iTunes open on your PC. — Connect your iPad to your PC via its sync cable. — When you connect the iPad you’ll see a popup letting you know that there is an update available – ‘a new iPad software version (5.0). Click the Cancel button. — Do a full backup and sync of your iPad with iTunes. — Disconnect your iPad and then reconnect it. You’ll see the popup again to update to software version 5.0. Click Download and Update and then just follow along with on-screen instructions and status updates. Update: It looks like iTunes may be forcing a backup as part of the update process for iOS 5, or at least it is on my iPhone 4. I still prefer to have a manual backup and sync before updating, but it looks as is this is now being incorporated into the update process. Just a few days back I posted asking where all the iOS 5 app updates were. Well, over the last couple days the iOS 5 updates for iPad apps have really started to flow. I currently have around 200 apps installed on my iPad 2. This morning their were 28 updates available and the vast majority of them were at least partially to add iOS 5 support or features. Today is iOS 5 release day, so obviously it’s good to see so many more updates coming along now. 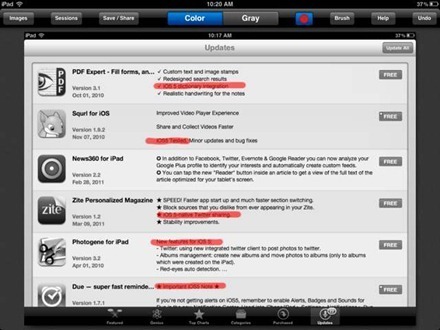 Where Are All the iOS 5 iPad App Updates? With the release of iOS 5 coming in just a few days – on October 12 – I’m still not seeing a lot of iPad apps getting updates for the new OS version. I’ve seen a handful – most recently iA Writer and Evernote – and at one point thought the pace of updates was increasing, but lately not so much. I’m basing this only on the updates I see for my own installed iPad apps (around 200 at the moment) and in RSS feeds for updated apps. Unless what I’m seeing is not representative at all of iPad apps as a whole, then there are very few apps that have been updated leading up to the iOS 5 release. So I’m wondering if this means the majority of apps don’t need updates, or the devs ares till working on them, or I there a backlog of updated apps under review by Apple. If you’re an iPad app developer and you have any thoughts or insight on this, I’d love to hear them in the comments. One of the very new ‘PC Free’ features of iOS 5 is Wi-Fi sync – wireless sync between your iPad or iPhone and your PC. This will allow you to keep photos and videos, music, and apps in sync without having to connect your iPad to your PC via the sync /charge cable. Once this feature is enabled, every time you connect your iPad to a power source it will automatically sync and and backup any new content purchased on the iPad to iTunes. 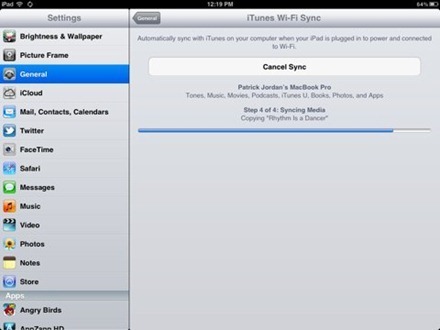 You can also manually force a sync by going to Settings > General > iTunes Wi-Fi Sync and tapping ‘Sync Now’.